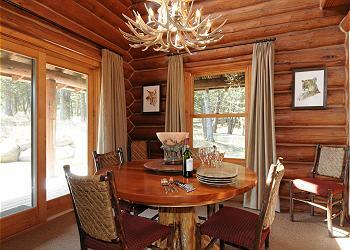 Guests have access to all the amenities of the Sun West Ranch plus 200 private acres. 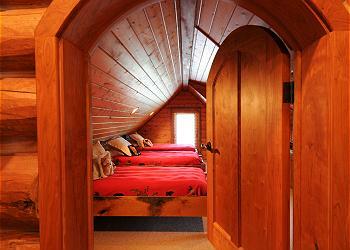 The house has six separate beds, it’s a great spot for a family or a group of fishermen. Visit the wonders of Yellowstone National Park just half an hour drive from the home. 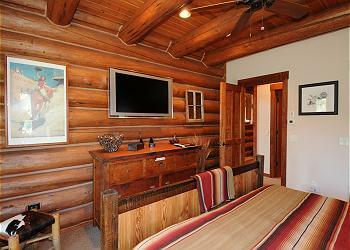 The homes has satellite TV and wireless Internet. 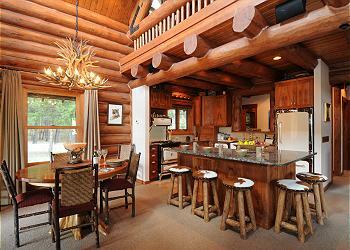 BRIEF DESCRIPTION: Towering Pines is a beautiful three-bedroom log home full of custom furnishings. 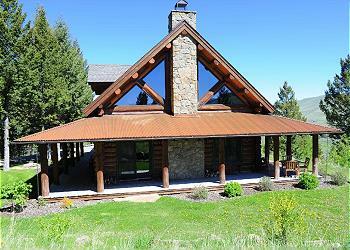 The home borders the pristine Sun West Ranch and sits just above the Madison River, giving you access to the 1,600 acres of common area on the Sun West Ranch plus 200 private acres of your own. This area has been left wild with just a few dirt roads and three miles of Madison River. With such a large piece of property it is essentially a wildlife preserve. 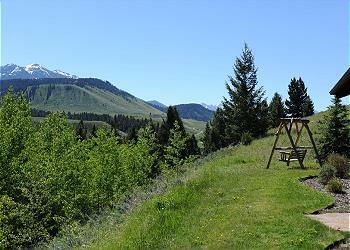 You will likely see eagles, deer, elk, coyotes and lots of other interesting wildlife on the property. BEDROOMS AND BATHS: This home has three bedrooms plus a bonus room. 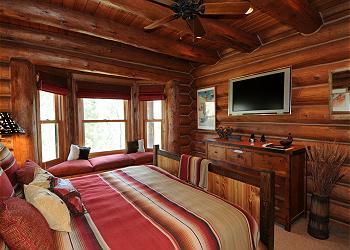 The master bedroom is located on the main level of the home and it beautifully decorated with western décor. 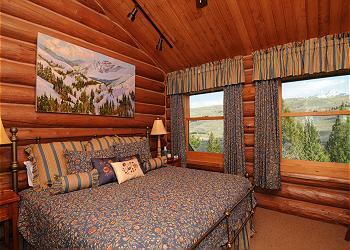 It has a king size bed, seating at a big bay window, and a flat screen TV. There is a master bath with a tub and shower combo along with rainwater showerhead. 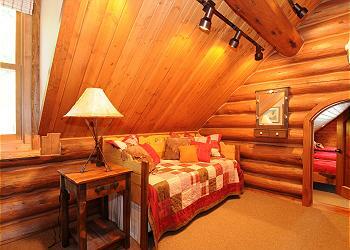 Upstairs there are two bedrooms and a bonus room. The first has a king size bed with a flat screen TV. 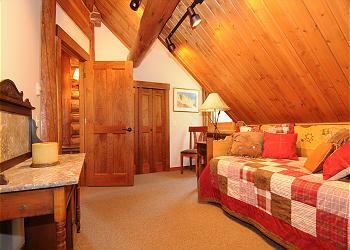 The second room has a trundle bed with the bonus room attached. The bonus room has three twin beds, a couple of kid-sized chairs and a TV. There is one bathroom upstairs with a stall shower. 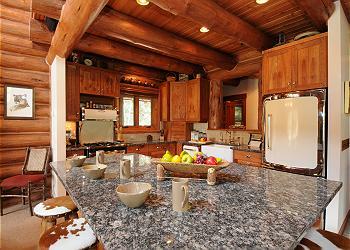 KITCHEN: The kitchen, dining, and living areas all flow together to create the great room in this cozy western home. The modern appliances have an antique look and the cabinetry is all custom cherry, adding to the western and rustic décor of the home. The very well appointed kitchen has everything you’ll need. There is also a gas BBQ out on the deck if you prefer to grill your meals. DINING ROOM: The dining room table seats four to six comfortably and with additional seating for five at the bar, you’ll have plenty of room for company. LIVING ROOM: You’ll be comfortable whether you’re seated on one of the cozy leather chairs or playing games at the dining room table. There are lots of windows to take advantage of the lovely views and glass sliding doors to take you out to the front or back of the home. There’s a flat screen TV and a great sound system with built in speakers, making it a very appealing place to come home to after the day’s adventures. LOFT: In addition to the bedrooms upstairs, there’s a great office/reading area in the loft that overlooks the living area. 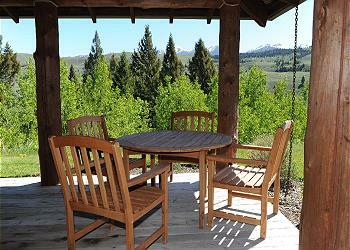 OUTDOOR AMENITIES: Several chairs line the wrap around porch. There is also plenty of outdoor seating, including a picnic table under the trees and a bench swing with a view to die for. SETTING, ACREAGE, VIEWS: Nestled in the pine trees on a hillside above the Madison River, this home has a remote wilderness feeling. 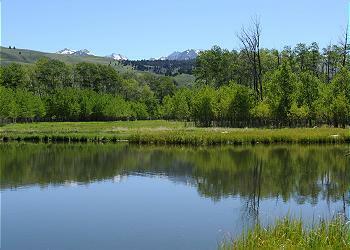 A short walk from the home is the Madison River that runs through the property. 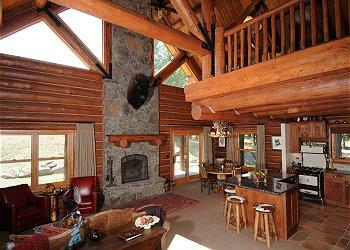 This property is surrounded by the 2,000 acre Sun West Ranch and by forest service land. It really is like having your own private Yellowstone. 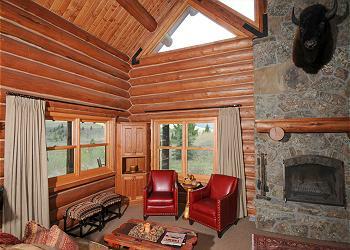 You are also just half an hour from Yellowstone National Park. DISTANCE TO TOWN AND AIRPORT: Sun West Ranch is located 30 miles South of Ennis and about 30 miles North of West Yellowstone. The drive to Bozeman's Gallatin Field is about an hour and a half. ACTIVITIES NEARBY: You’re in the middle of fishing heaven – with the Madison River, Yellowstone National Park and Henry’s Fork of the Snake River close by. 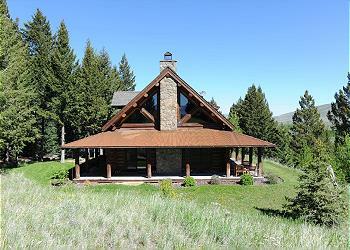 There’s also hiking, mountain biking, exploring Yellowstone National Park and nearby ghost towns. There is so much to do! Because we had a great stay on this classy property, my family and I booked again for this year's vacation. 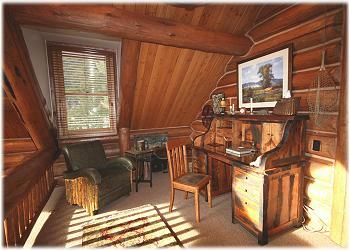 The cabin is gorgeous (The cherry woodwork is impressive. ), and the views are perfect. 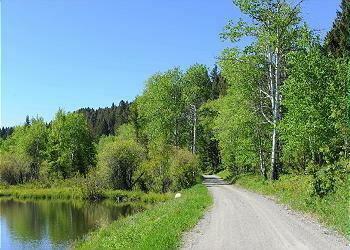 It is a private location and just a short drive from our favorite fishing spots on the Madison. The on-site access to the river is difficult to wade in June as it is still run-off season, but we did catch trout. The new Office Manager was very welcoming, and we were left to enjoy the property, which was much appreciated! We stayed for 5 nights at this home in Sept. 2016. We had a group of 6 which included grandma, a couple friends, my wife, and our 2 year old son. The house is beautiful and has everything you could need. 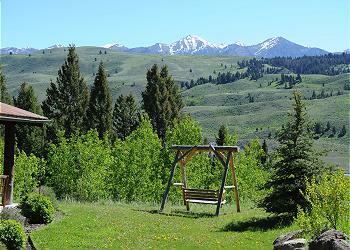 The ranch that is located on is nice and makes it feel isolated and tucked in the mountains. There are not any neighbors near by. 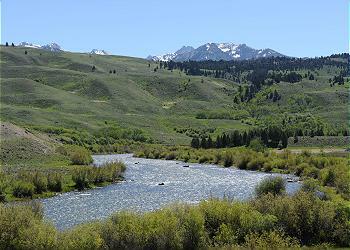 We picked this location for access to fishing the Madison river along with day trips into Yellowstone. I was a little disappointed with the access to the river. I thought it would be an easy walk to the river but it was not. The house is up on a steep hill and the best access to the river is by car and parking at the bridge that crosses the river as you come in, which is a few minute drive down the road. The best fishing location is at the bridge in between the supports. We caught numerous fish in that location. Also, the house had a spare fishing pole available to guests if you do not bring your own. The house also had bear spray for use, so no need to stop and buy any. The house was accommodating for our 2 year old. We blocked off the stairs with chairs so he could not climb up and there were not too many things he could get into. We brought rubber bands to put around the cabinet door nobs to keep him out of there. The dishwasher door is heavy and has no spring loaded support so he pulled down once on it and it fell on top of him, but he was fine. The drive to park was under construction on the Montana route and forced us to take the route that passes through Idaho. The Idaho route took us around 50 minutes to get to the west entrance of the park. Once construction is done I think the other route would be 15 minutes faster, we just got unlucky with it being under construction. Its part of the sun west ranch which is a couple thousand acres and has several homes spread out across it. We saw elk, mule deer, white tail, bald eagles, and ospreys at the ranch. We made a day trip to Wade and Cliff Lakes which is only 25 minutes away and it was beautiful and crystal clear water. They had kayak rentals at some cabins as you come into the lake but we just came to enjoy the scenery and let our son throw rocks into the lake. 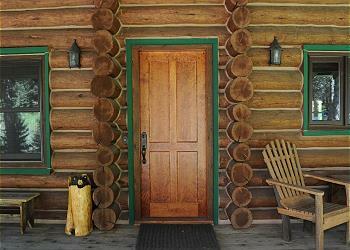 This home had all the comforts of home and was decorated beautifully. We did not want leave and will definitely stay here again. Also Mountain Home Vacation Rentals were great to work with and went out of there way to get us a pack and play for our son. WOW! What a great place. What was there not to like! What was there not to like? The setting was gorgeous. The house was beautiful and very well appointed. We are already talking about a return trip. The house was stunning. It looks better in person than in the pictures. The herd of elk one morning was a nice surprise. 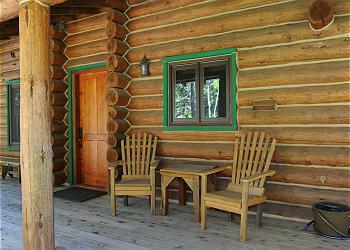 We rank it number one in the many vacation houses we've rented over the years. It was a bit further to Yellowstone than we thought - took a good 50 minutes to get to the gate. But the beauty and serenity made up for that. 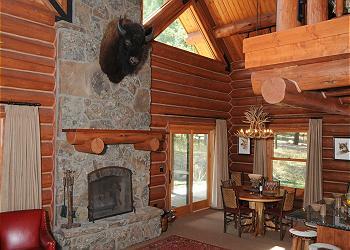 Great place for two couples, abundant wildlife right on Sun West Ranch. Had deer right in the yard, elk all over the ranch and had two moose bedding down at night right down the hill from cabin. House has all the amenities. Spices and flour, oil, tin foil, fans, coolers, washer and dryer. We had breakfast and supper at home almost every night and would pack a cooler with drinks and food for lunch in YNP. We put 2900 miles on our rental in the two weeks we were there and only in YNP 7 times. Lots of elk and antelope along the roadways. We even saw an antelope giving birth. Hope you enjoy your stay as much as we did. Oh, one last thing. Walk outside at night at look up. OMG, we didn't know there were that many stars. !